At Everlong Events, we love celebrations! Whether you’re planning your dream wedding, engagement, birthday, baby shower or corporate event, together we can make it memorable for all the right reasons. Our services are highly personal and we work closely with our clients to create exciting and unique events with a personal relaxed approach. Styling packages, event planning & coordination, prop hire, pop up proposals, elopements, handmade stationery and signage - we’ll take care of all of the styling details on your behalf to create an event that will leave a lasting impression. Everlong Events are based on the Central Coast, though also service the Hunter Valley, Newcastle, Sydney and beyond. At Everlong Events, our styling sets the scene of an unforgettable day. Everlong Events pride themselves on their attention to the finer detail, on unique ideas and on the smooth delivery of each and every event. Everlong Events tailor their packages to suit your style, budget and needs, whether that be your entire ceremony and/or reception, or just elements of these, for example, ceremony seating or an arbour only. Everlong Events are well known for their extraordinary wedding and event design. Exceeding expectations is what they aim for on every design. Other services they offer are full wedding and event planning, on the day coordination, dry hire, dry hire + delivery, set up service (placement of your DIY items), pack down service (taking the stress away from you having to do the clean up the next day), location shoots, corporate styling and more. If you already have a style concept in mind, our hire collection is sure to impress. Unsure what to select? We can help guide you towards the decorations and props that will achieve the look you have in mind. Vintage Lounge, Outdoor Lawn Games, Seating (Peacock Chairs, Bench Seats, Tiffany Chairs, Americana Folding Chairs and our Mismatched Chair Collection), Turkish Rugs, Easels, Drink Stations, Centrepieces, our Vintage Brass Collection, plus so much more. When it comes to the perfect occasion, it’s the finer details that make all the difference - those delicate final touches that greet, guide and surprise guests at every turn. Our portfolio includes custom made welcome signs, seating charts, unplugged ceremony signs, name cards, menu's, rose petal cones, plus more. See the photos and read the stories of the couples we have worked with to create a day special and unique to them. 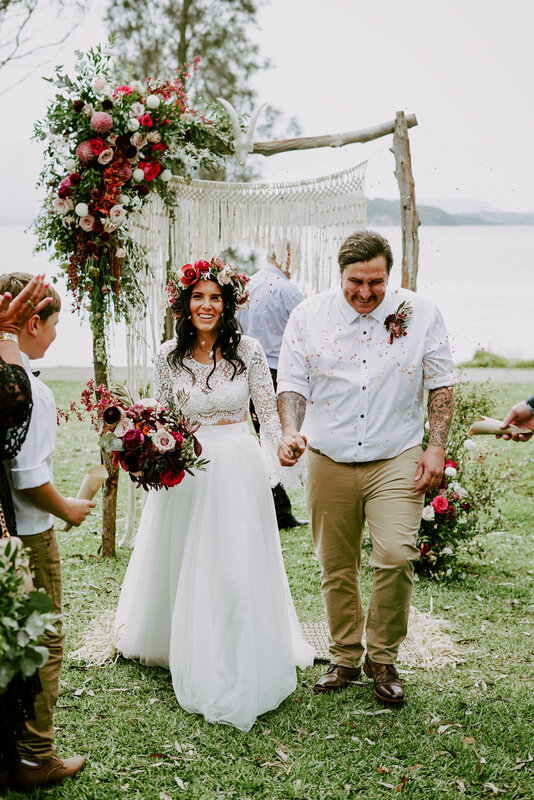 These real weddings give you a chance to see some beautiful local venues styled by Everlong.